The blog of Jacquelyn White. I’m not sure if I’ve mentioned this before but my library system is slated to be getting a new main central library. Right now everything is in the planning stages, we don’t even know where it will be. But everyone is very interested in what will go into the new library. A couple of years back one of our branch libraries got a new building. The community input for that was great but minimal. We’ve held several public meetings and they were well attended. In the last couple of months the question of what kind technology should be included in the new library. Word has filtered back, via the commissioners, to the library that some people are wondering why we need to build a new building. After all do people really use the library anymore? If we build a new one we should just stuff it full of computers, that’s why people use the library if they do use the library, right? For some weird reason I am always surprised when I hear people actually think like this. I mean really? 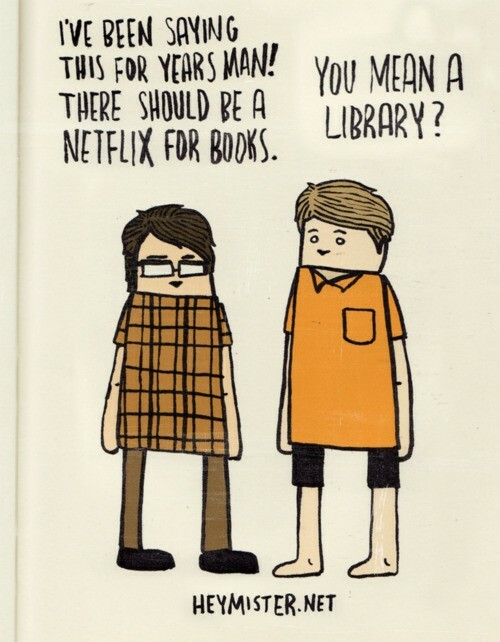 For all libraries, academic to public to special, they all seem to have at least one thing in common. Letting people know what they do and how valuable they are to their community. I find it that every time our new building comes up in conversation, what the library does comes up as well. About a month ago my director asked one of my old professors from library school, Dr. Anthony Chow, to come to our library and do a presentation about libraries and future technology. It was a great presentation, it was well received among those who were in attendance. Our deputy county manager asked some great questions and was really engaged. This presentation led to a committee being created of local members of our city chambers. The point of the committee I am told is to give us and the commissioners recommendation on what technology should be included in the new central. This past Monday we met with them to do a presentation on where the library was now. I presented on our virtual library, which isn’t exactly part of the technology but is just as important. We kind of went into the meeting trying to prove that as a library unit we are actively aware of current technology and all. Not that we don’t welcome community opinion, because we do. But at the end of the day like every other library it comes down to funding. Sure we would love to provided both pc and mac computers but those trusty dells are so much cheaper to obtain and maintain. I think we got our point across but I will be interested to see what the committee comes up with. We will not meet with them again while they come up with recommendations. Truthfully after our presentation the conversation became more about partnering with these community companies as suppose to what technology was in the library or needed. It’s been about a year since my library was awarded a LSTA grant for our Homelessness Project. We still have yet to rename the project and refer to it as the Homelessness Grant. I’ve been very hesitant in writing about the grant because I’ve been on a roller coaster of emotions about it. On the one hand I understand and totally back the idea that it’s needed. Urban libraries across the nation, possibly the world, service many persons experiencing homelessness. As long as that state of living exist libraries should and will be there to serve them. On the other hand there are times in the last year that I’ve feared we’ve taken on more than we are capable of actually accomplishing. It’s compounded by the fact that so many people/groups/organizations are looking at this project for validation either positive or negative. We’ve made some great progress in some of our entertainment focused programs, and even our Men Rap Session is growing every session. However our informational programs, not so much. It could be that the topics are off, we haven’t nailed the right times, or a number of other things. I feel very connected with those programs because they were my idea, I came by them after reading the literature and listening to all of our community partners. I want them to succeed but at the same time I’m not sure what success looks like in regards to them. With the new position my role on the committee might be changing, different responsibilities and all. Any day now we are going to see if Year Two is approved to continue on the grant, I think we’ve done great work for the first year especially since this project is somewhat new and untested in the field. I think we are still figuring out things and understanding where the Library plays a role in this. Back in April, April 15th to be exact, I started a new position within the same company. I’ve moved from Information Services (Reference) to Computer Services. I am now my system’s Internet Services Librarian, it was kind of a quick turn around. It was a surprise to me when the previous Internet Services Librarian left and at first I was hesitant to apply. In the end I posited that it would be a positive thing for me even if I did not get the job. But I got it! Overseeing, maintaining and providing content for Library’s web pages and social networking sites – I work closely with our county’s webteam, as well as play the-go-between between them and our staff. And of course projects and duties that come up out of necessity. I’m really enjoying myself, it’s a different world as compared to the reference desk. I still work with the public through providing customer support with our downloadable media, but mostly I’m behind the scene sort of speak. With this position come new challenges and successes, some I’ll have to catch you up on. Hopefully I’ll be more inspired to catalogue it, you know the whole reason I started this blog. 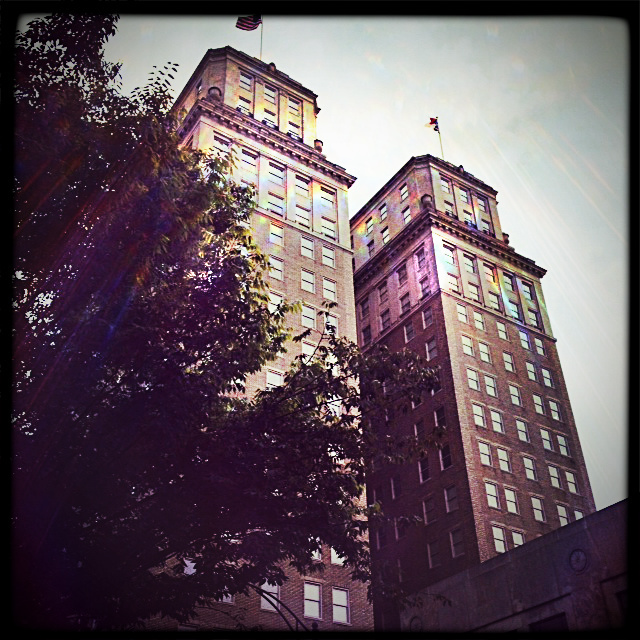 The Nissan Building in Downtown Winston-Salem, NC. Taken while on my daily walk during lunch. This week marks my one year anniversary as an Information Services Librarian. My how time flies. I’ve had my annual review and it was all positive and I just can’t wait to see what this next year brings. I wish I could type more but I’m working on limited sleep and coming from working the full 40 hour week and the both Saturday and Sunday so I’m a little brain-dead. Currently I’m preparing to move into my new place and working on programing ideas for the autumn season. But I couldn’t let this week go by without acknowledging that I’ve been a professional librarian for a whole year now. Yay! Remember back in January when I mention that I was on a committee writing for a L(ibrary)S(ervices)andT(echnology)A(ct) Grant, I think I might have mention that we had been approved to submit a full grant proposal and that we sent it off around the beginning of February. I learned a lot about writing a major grant which has helped me during the beginnings of writing another grant that I’m working on for my library (but that’s another post). Middle of May we got an email saying they would make their announcement around the middle of June. Which should have helped with the waiting but instead made it seem even longer. This past week they announced that we had received the grant! Now it has to go before our county’s commissioner’s for approval. Exciting! Is it just me or does the memorial day holiday signify the start of summer? I remember as child today marked the day that the pools opened, longer days of playing outside because school would have just gotten out for summer vacation. 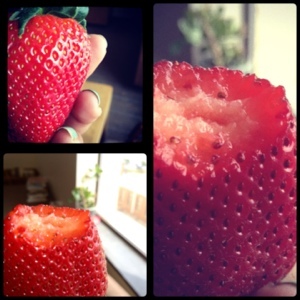 And all the self picking strawberry patches opened up. 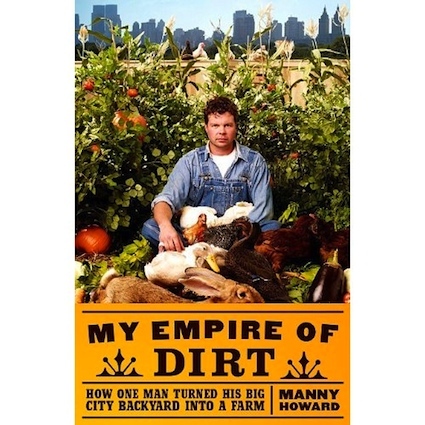 Summary: My Empire of Dirt is a cautionary tale of how Manny Howard took on an assignment from his agent to write an article about how he turned his suburban backyard into a farm and ate only what grew in it. Manny Howard is a writer who grew up in New York, now with his wife and two kids he sets out to produce enough food to feed him and his family for one month. He has little knowledge of the plant world and even less on creating an urban farm capable of producing that much food. But what he does have is a can do attitude. Starting with a backyard of nothing, layers of baked clay that is family barely spends any time in and barely conceived plans for what he has dubbed “The Farm” he sets out on an adventure that changes him and his family. My Thoughts: With in the first few chapters of this book I was met with animal carnage and the prospect of “The Farm” hadn’t even been pitched. That’s when I knew this was going to be a good book. Howard has a way of writing that pulls you into his mind and convinces you that his half-baked plans and impulse way of doing things is the only way to go about these sort of things. Throughout the telling of how he transforms his backyard into The Farm he also gives you insight to how his family transforms and his reasons for continuing the project after every possible thing could go wrong. Admittedly he does go off on long tangents that seem at odds with the rest of the book, for instant there was a multi-page history lesson on the city mid way through the book. I’m still not sure how that plays in the grand scheme of the book and the story but history lessons aren’t all bad. I really enjoyed reading this candid story of starting an urban farm, and even though I have dreams of possibly doing the same thing in the future it made me realize how much there will be too. It’s something that changes you from the inside out; mind, body and soul. I recommend this book for anyone thinking of tackling even the smallest of urban farms, or thinking about getting a few chickens and planting a few veggies to help with food costs. It’s really amazing to see how routine my life is at work now. Sometimes I stop and think about the fact that I haven’t made it to the year mark but I’ve already established myself into the department. Of course there are tons of things still yet to be learned but I no longer feel the rush of “OMG! You want me to be here alone? !” Every time I’m left in the department without back up. I am currently working on yet another grant proposal that is due in less than 2 weeks. It’s just me working and I am slightly overwhelmed but my supervisor has faith in me so…we’ll see how this goes. This afternoon I attended a Circulation Forums which was more of training and revisiting of circulation policies. This was great in itself, being on the Reference desk I do not interact with these circulation policies on a day to day basis. However these policies do affect other aspects of the library experience namely access to the computers. And every now and then we do field questions about circulation issues. There were some things that were covered that I had no clue about and things I had forgotten. Being honest and upfront I do have to admit I was not really expecting the training bit…since it was announced as a forum I was expecting more talking about current circulation issues and thoughts about working through them. But the training is always welcomed.